This is an ongoing project and has changed considerably since the early days, so your feedback is important. Sometimes it's just a case of not being able to see the forest for the trees and so once in a while it's nice for someone to point out a tree or two! The site started out by providing free, funny email templates that you can use to send to your friends. They are unique, and if you haven't looked at them yet, then click here for a quick look. Since then, I've added so many different things that I couldn't list them all here without boring you to tears, but you can go to the home page and start there if you want. If you have any comments or suggestions, then let's hear from you in the form below. Thinking Of Starting Your Own Website? Watch this short video about Site-Build-It. That's what I used to build this site. It'll work for you as well. I love giving away free stuff. 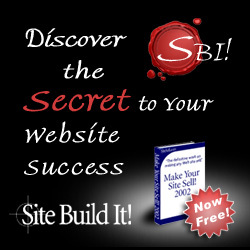 Here's a free e-book for you from Site Sell - the people who helped me build this website. Download it and build your own site. If you haven't already checked out the Funny Email Messages templates, then click above. Go here to check out the various verses that you might be able to use with a blank greeting card. Use one of these business email templates if you have enough nerve to use humor in the workplace. We need more people to be less serious about their business correspondence! Get more information about me and how the whole funny email concept started by going to this page. This site is all about having fun. Make sure you haven't missed some of the different ways I do that. Click above to go to the home page.